If you have a unique product container shape, you may be trying to decide on how to go about labelling your unique shaped container. Is it with self-adhesive (printed) labels? These are a great option if your product is new and the market response is untested. Or perhaps you want to use shrink sleeves which create a powerful impact but are better to use with more established products. Would direct screen prints work better? Direct screen is often used with odd shaped bottles or textured containers but as they are very costly it is better to use direct screen printing on high volume items. 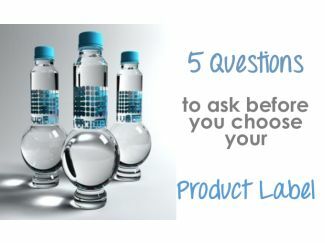 With the above options in mind, it’s important to ask these 5 questions in order to understand which one is best suited to your product. 1. Are you trying to show the contents or enhance your graphics? If you want to show the contents of the product then a shrink sleeve option would not work as well as a printed label or direct screen printing. A shrink sleeve would cover the whole container (and therefore the product inside) whereas a self-adhesive label or direct screen print will use up less of the surface area available. 2. Where will the products be stored and displayed? This point is vital as if the products are stored in a freezer you will need a label that can adhere to these conditions. In this case labels with special coatings or laminations will be durable enough to withstand harsh storage conditions. 3. Is there legislation around what you have to display on your label? As we mentioned in a previous article, in South Africa there are relative information and legislation requirements when printing labels. Each product label must include the company logo, product description, country of manufacture, allergens, company contact details, barcode, ingredients, weight, nutritional information, recycling codes, material codes and storage information. Therefore you will need to bear in mind what needs to fit on your label and how big your container is. 4. Will the label fit your container? If you have a round container an irregular sized label can be designed to suit the unique container shape. 5. What production process is needed? Knowing what is involved in the production process will help you to choose the right label manufacturer. It’s important to partner with a Label Manufacturer that has the experience and expertise to print the label that is best suited to your product. Rebsons Label Manufacturers have been in business for over 60 years and can provide you with all the information you need in order to manufacturer the perfect label for your product. Contact Rebsons Label Manufacturers today for an obligation free quote on your label printing needs.